It consists of a single L-shaped room, with the bar along the long side of the L and two corner entrances facing it, while the short leg of the L leads back to form a little annexe containing a pool table. A total of three flatscreens are arranged around the pub. According to their website, there's also an outdoor area for the smokers, but we didn't manage to discover this on our visit. Decor is traditional, neat and clean, with a patterned carpet, a fruit machine, a jukebox, and football memorabilia on the walls. Leather banquettes line the walls, fronted by wood and wrought-iron tables. Small high tables encircle a couple of pillars in the centre of the room, with tall chairs arranged around, and more tall chairs are pulled up to the bar. Kake and Giles visited on a Wednesday lunchtime in September 2012. 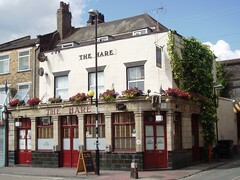 There were three real ales on: Greene King IPA, Timothy Taylor Landlord, and London Pride. A pint of IPA and a half of Landlord came to £4.80. There were around five or six other customers when we arrived, with plenty of conversation going on, and although by the time we left these had dwindled to one, the place still didn't feel empty. There was also a pub cat wandering around, which is always nice to see. Kake's verdict: Although the ale selection isn't too exciting, the ambience was good and I'd happily pop in again if I happened to be passing. Accessibility: A step to get in at both entrances. Another large step to the ladies' and possibly also to the gents'. Last visited by Kake and Giles, September 2012. Opening hours taken from the 2013 Good Beer Guide. Last edited 2013-09-12 22:57:04 (version 2; diff). List all versions. Page last edited 2013-09-12 22:57:04 (version 2).